As you may know, Adobe stopped supporting the NPAPI version of Flash on Linux and the latest NPAPI version of Flash player at version 11.2 released back in 2012 will only receive security fixes. Even the security fixes to the 11.2 version of the Flash Plugin your Firefox is using will end on May 4, 2017, five years from the release date. I am sure your latest Firefox is complaining to you that your installed Flash plugin is outdated and Firefox is preventing it from running if you are using the NPAPI based 11.2 version of the Flash Plugin. 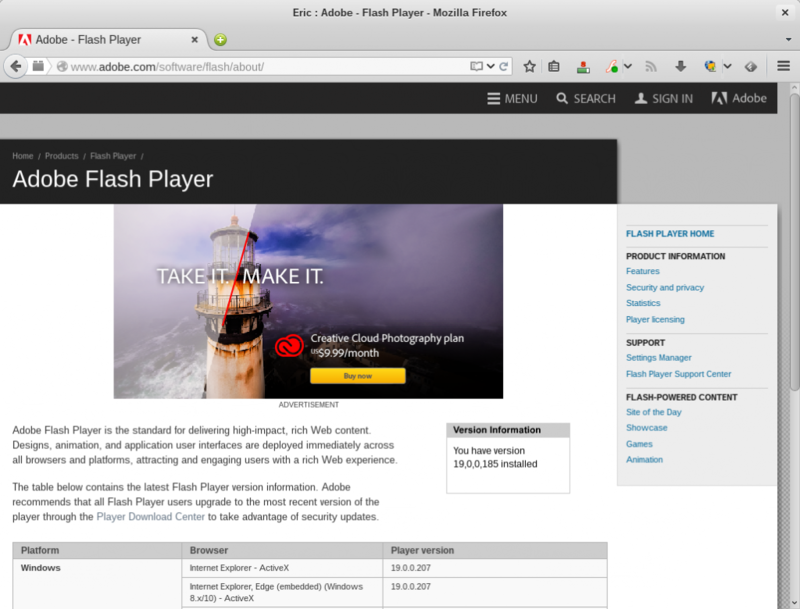 Adobe points Linux users to the PPAPI or Pepper Plugin API version of Flash Plugin included in Chrome. The Pepper Flash plugin can also be installed in Chromium and Opera supporting the PPAPI. For various reasons, Firefox developers are not interested in implementing PPAPI in Firefox by current. However, that does not mean Firefox users on Linux can not use latest versions of Flash. The open-source freshplayerplugin which is a PPAPI-host NPAPI-plugin adapter for the Flash plugin comes in and allows you to use the latest Flash plugin from Chrome in Firefox on Linux. This post will introduce how to use the latest version of Flash Plugin on Firefox for Fedora Linux. For Ubuntu users, I also provide a quick note. The very first step is, of course, to install Google Chrome as the Flash Plugin we will use is from Chrome. Please check How to install Chrome on Fedora Linux to install Chrome first. Get the pre-built freshplayerplugin library from this repository. For Fedora 22 x86-64 users, you can download libfreshwrapper-flashplayer.so by this direct link. Restart Firefox and you will see that the latest version of Flaush Plugin is detected and used by Firefox by trying the Flash about page (version 19.0 as shown in the following picture). You can also check the version detected by Firefox by browsing “about:plugins”. Following is the instructions for those who would like to build the fresh player plugin by yourselves. remote: Counting objects: 9977, done. Receiving objects: 100% (9977/9977), 5.69 MiB | 77.00 KiB/s, done. Resolving deltas: 100% (6819/6819), done. Restart Firefox and you will see that the latest version of Flaush Plugin is detected by the Flash about page. You may check the pre-compiled freshplayerplug from third party PPA by following commands. How to install Flash Player plugin on CentOS 7? The first one worked for me! Thanks . That’s nice and all, but Google has stopped supporting Chrome for 32-bit systems. Those of us still using 32-bit are left in the dark because there is no available downloads for Chrome. Chromium is an alternative; however, I don’t believe Flash works in Chromium for Ubuntu 16.04 “Xenial” based OS’s (i.e. Linux Mint 18). I know that Silverlight doesn’t work for streaming Netflix in Chromium. It takes manipulation of Firefox to get Silverlight to work for the 32-bit systems (Netflix streams fine in Chrome on my 64-bit machine).